Predictive analytics includes various statistical techniques of predictive modeling, machine learning and data mining which analyzes the facts from the past and present in order to make the prediction of future, basically unknown, events. The possibility of applying predictive analytics today is really extensive whether in the context of the industry that could use it, or in the context of a variety of key issues related to the business of each individual company. The reason behind this is the large amount of data that companies today possess. Predictive analytics is an upgrade of the business analytics. By using these statistical and mathematical methods on structured and unstructured data we gain insight into patterns and relationships among the data, which allows us to estimate the probability whether in future a certain event will or will not occur. Predictive analytics can provide answers to some key questions related to clients, business, capital or fraud. Solutions that Megatrend Business Solutions offers in the field of predictive analytics are used to discover new clients, to detect clients that are likely going to churn, to optimize existing stock, to optimize investment or to forecast a failure of the machine. In addition to that, we offer solutions that are used as an aid in risk detection, threats and fraud. This is made via constant surveillance system, the detection of unusual behavior and control of implementation actions that occurred during detection. 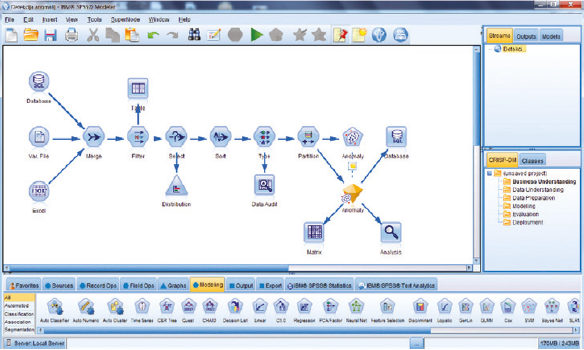 The company Megatrend Business Solutions offers solutions for predictive analytics drawing on IBM SPSS Modeler software. IBM SPSS Modeler is software that predicts the likelihood of future events using a variety of statistical and mathematical methods. In short, it lets you predict what will happen next in business so you can corespond to certain problems, make more specific and better defined decisions, and thus improve the performance of your business. For more details on IBM SPSS Modeler software and solutions that we offer contact us by phone +385 1 4091 300 or on e-mail poslovna.rjesenja@megatrend.com.